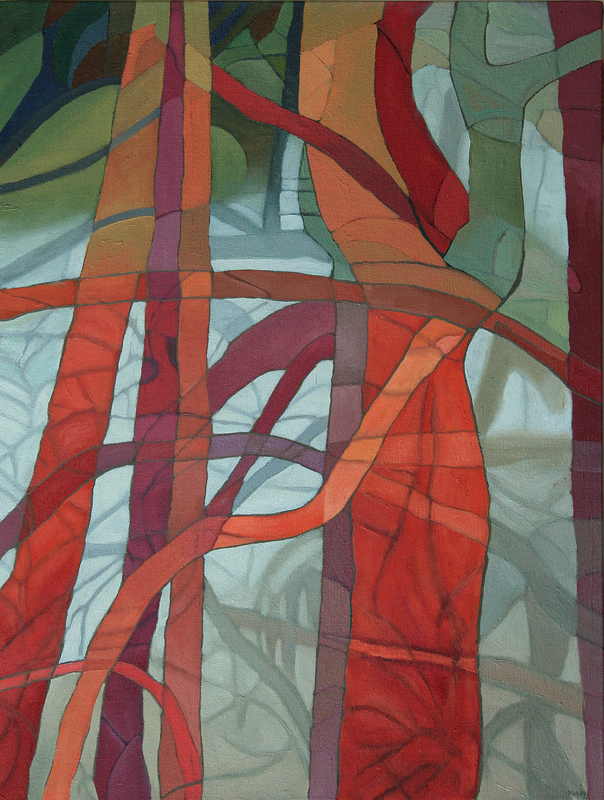 Susan Makov thinks of her work as a discussion between herself and the trees she paints, but there is plenty she would change about this world of ours. Her paintings and woodcuts at A Gallery show a deep concern for what is happening to the forests and oceans and the creatures residing therein. You can see for yourself at the opening Friday evening. 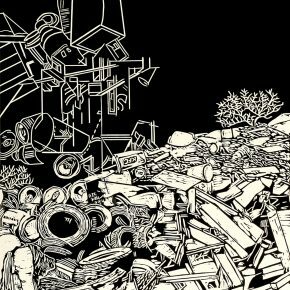 Walking down a narrow corridor you’ll find half a dozen of her woodcut prints – the first, the stellar “Coral Reef Debris,” (14”W x 18”H) depicts a sort of oceanic junkyard, old tires piled high, aluminum cans with pop tops carefully rendered, a KFC paper cup, stacks of lumber with a tiny tree emerging from the rubble. It’s an environmental message, yes, but so beautifully drawn one could easily live with it hanging on a wall. Another excellent and complex woodcut print, also 14”W x 18”H, “Leftovers in the Woods” again has an environmental theme: A Kingfisher surveys a trashy realm, tail feathers tipped up to the sky. It has an unexpected charm. 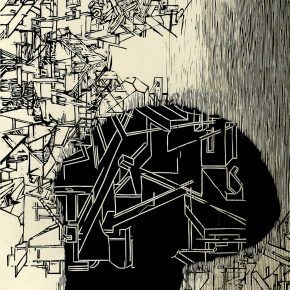 Some woodcuts like “Is It All in Your Head?” (14”W x 18” H) are almost purely political. The piece is about dealing with global warming, Makov explains, when “everyone says it’s ‘all in your head.’ It is a question. And a lot of it is architectural elements. I’m not doing just decorative beautiful pieces.” It is an uncomfortable work that takes effort to comprehend –if that is possible in a gallery setting. Two more woodcut prints grace the center gallery. The intriguing “Rising Water Levels” features whales, dolphins and some abstracted fish crowded together in a lessening sea. This was clearly meant to make one think – and it does. 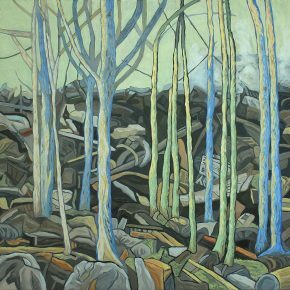 “Still Growing” (40”W x 30”H) (oil on canvas) is tremendously appealing in its depiction of bare trees following a fire, a few quite charred, many apparently survivors. Smoke rises before the mountains at the back while human presence is made evident by a toppled trashcan in the foreground. “Cobalt Tree” (24”W x 36”H) is reminiscent of stained glass with fabulous blues, yellows, greens and browns making up the work – it flows. Next to it is “Message from the Vines” (30”W x 42”H) (oil on canvas) with a similar stained-glass effect that, however, seems a little forced. “Fog,” oil on canvas on panel, just 18” wide x 24” high, feels like one is taking a walk in the woods. Gnarled tree limbs in oranges, purples, pinks and greens emanate from an orange trunk with Makov conveying a mist in grays floating behind and through the branches. One understands about tongues in trees; about trees speaking an unknown language. There is great effect and affect achieved here. There are three large paintings in the windows at A Gallery. 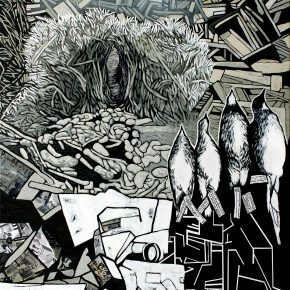 “Nest” (4 x 3 feet, acrylic on canvas with collage) is particularly striking, although it contains images of four dead birds, not a favorite theme of this writer. But Makov explains that while volunteering at the Museum of Natural History she was able to go in the back and “open drawers” and that was where the specimens of these Bower birds were discovered. It’s a variation of the print, “Collection of a Lifetime,” on display elsewhere in the gallery, but she says she enjoyed adding color to the larger work, that it was easier than doing the black-and-white woodcut. Known for her books and broadsides as owner of Green Cat Press, Makov is professor emeritus at Weber State University, where she taught printmaking, illustration, 2D design and book arts from 1977-2015. She has been painting seriously for two years now, though she notes that her parents both were painters and she once studied painting at Syracuse University. This is her first show. It was while hiking with friends that she connected with the trees so much she knew exactly what she wanted to be doing – and she just started doing it. She takes photographs for “a memory jolt” but there is nothing photographic about what she paints. “What I’m actually into, which sounds a little woo-woo, is part mysticism and part outsider art. My mother was actually a psychic. So I was around her enough to know about a communication sense with nature. . . . Pat Eddington (see our story on the late artist here) and I were together for so long and one of the big things we both enjoyed was looking at outsider artists,” Makov says. “It’s kind of the mystical quality that happens with a lot of outsider artists where there’s this strange language and you can’t really understand the calligraphy or written words that they use and yet it’s their sense of communication, and so I feel the same way with the trees. I start looking at them and I think, ‘It’s all paragraphs.’ All these branches seem to be these different kinds of stories for me. Whether it’s political or nature-based or simply one organic being to another, there it is. I was so impressed at the way Susan defines her ideas about global warming, all our garbage, etc., all through her art. Her colored trees are so exhuberant and inviting. It is a great show. Susan is not afraid to take the time to complete intricate pieces. Congratulations on a great show.